I hit a creative road block last week. It happens more often then I like, and despite lots of ideas popping around in my head, everything I make feels off. I start to feel like a drain with a clog in it. No flow. So, I decided it would be a good time to empty my scrap bin. 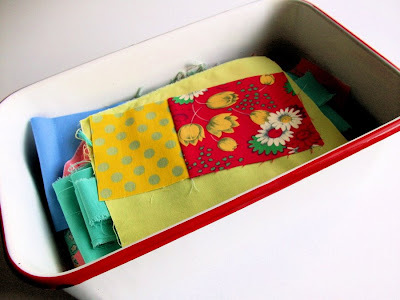 It's a lovely old red and white enamel pail that I keep by my sewing machine, and at the time it was filled with lots of bright colors, oranges and blues, purples and yellows, all from my last few sewing projects. 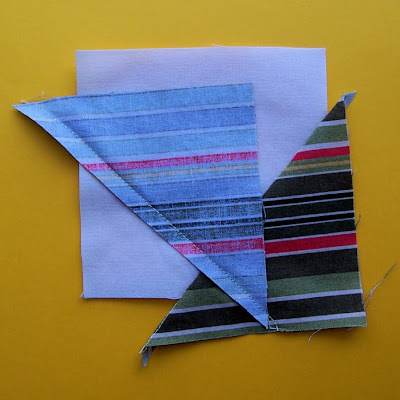 Using my scraps often helps to break up the creative clog. It acts sort of like a creative Drain-O! I definitely think that there is some kind of energy moving correlation between freeing up our outer space and freeing up our inner space, thus helping the creative flow to return. 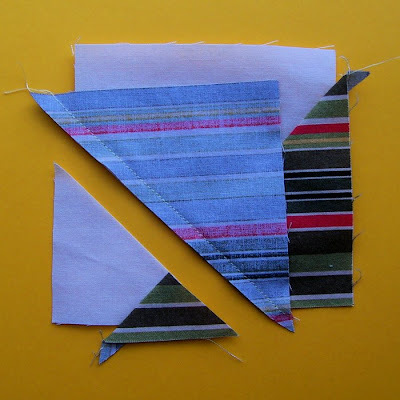 I pulled out the strips of fabric, sorting them by size and just began to sew. 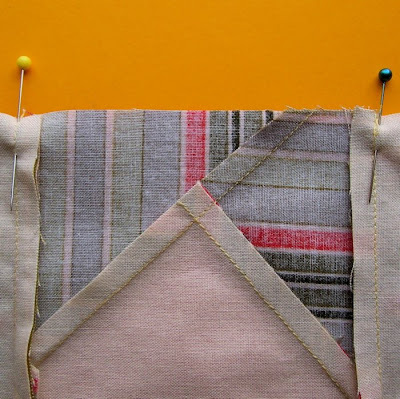 After I had made a few sections I started to move them around listening to my gut, along with the fabric, until I had arrangements that looked pleasing and right. The first is called "Dialogue" and is available "here. 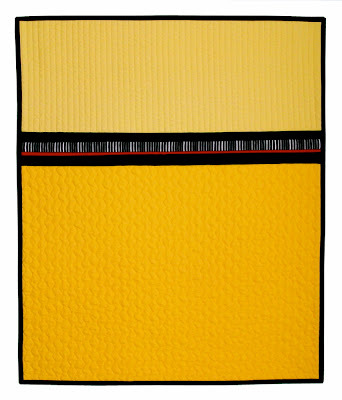 And the second, titled "Conversation", (my personal favorite of the two) is available here. It looks like a busy week awaits me. Taxes need to be done, (ugh!) a couple of appointments to keep, and oldest daughter is coming home for spring break, (Yay!) and for her 20th birthday, (Yikes!) So, if I don't get around to another post this week, I hope you all have a great one! Also, very best wishes to Rachel of Fog and Thistle. Rachel will be appearing on the Martha Stewart Show this Friday! She will be showing off and demonstrating how she makes her fabulous nightlights. I will definitely be watching and cheering Rachel on!! PS. Mo's had a couple of really great days, with amazing bursts of puppy like energy! 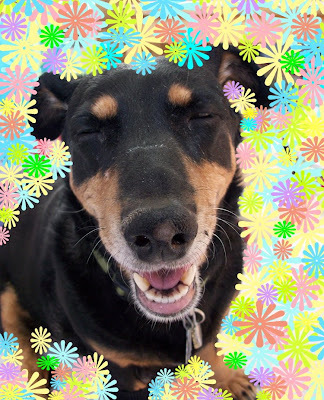 I think she has spring fever, and it does my heart good to see her so happy! Sorry I haven't been posting this week, or visiting everyones blogs much, but I have been deliberately trying to slow down, and smell the proverbial flowers a bit. I think I need to do this more often. It feels good. It clears my head, and believe me when I say, my head needs clearing. It's all cluttered with too much thought. Mo had a bit of a rough week. Lots of congestion and some bad breathing problems. We spent a lot of time this week just being with each other. Appreciating each day. Way more then we ever thought we'd be blessed with. Lots of gratitude. We also made time each day for a good laugh. As you can see, Mo loves a good laugh. 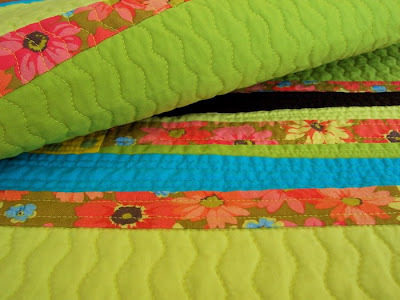 Inspiration is everywhere, and happily quilt ideas pop into my head like Jiffy Pop popcorn over a campfire. 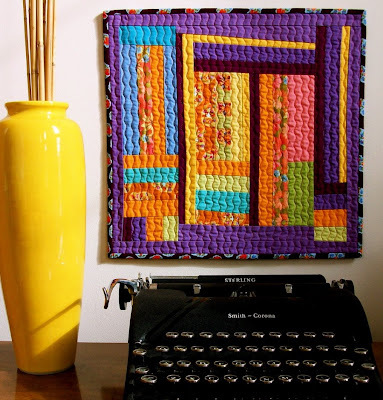 This modern studio art quilt was inspired by the colors of yellow taxis cabs, school buses, roads and road signs, thus the name, "Drive". 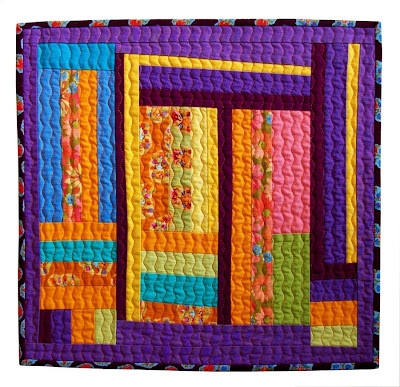 I love the minimalist modern design and bright colors of this quilt. Makes me happy! 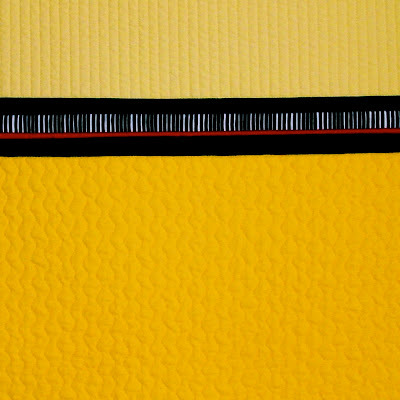 Drive measures 20" x 24" and is available in my Silly BooDilly Etsy shop. 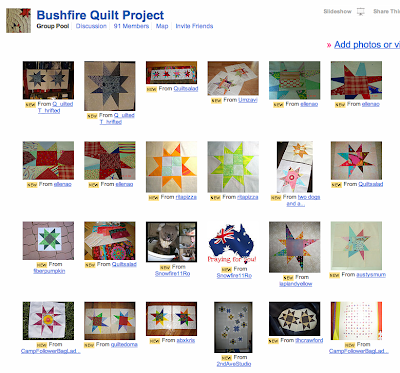 I also would like to thank everyone who left a comment on my Wonky Star Tutorial, for the Bushfire Quilt Project. I am delighted that it was of help! 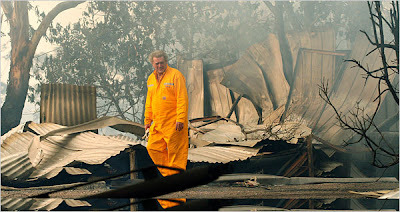 I've put a link up to access it over on the side. 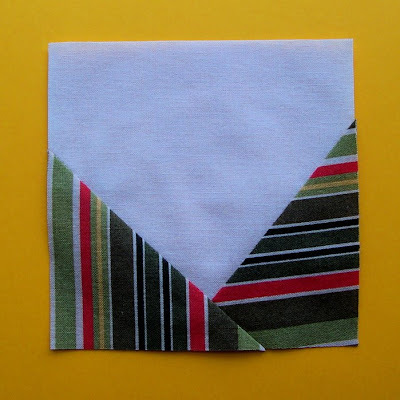 Here's a simply tutorial on how to make a 12.5" wonky star block for the Bushfire Quilt Project, which I blogged about in the previous post. (My apologies for the variations in the lighting of these photos, the clouds kept rolling in and out during this shoot. UPDATED NOTE: I wrote this tutorial, in an attempt to make the process as straight forward and simple to follow as I possibly could. 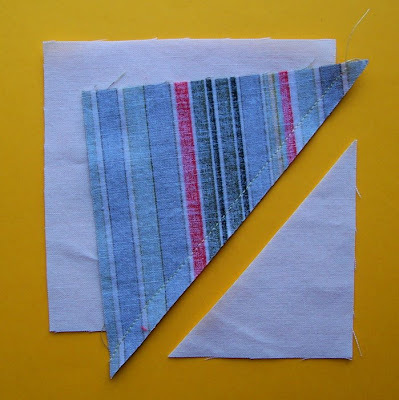 However, please know that if you use triangle shapes cut a bit larger, ( by an inch or two) you will have more leeway in how you position them and more possibilities in getting your star to be EXTRA wonky! 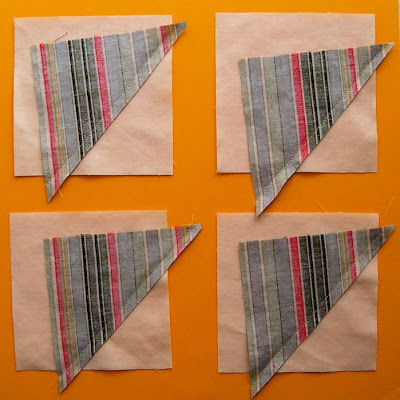 You will need to start with 13 squares of fabric each cut 4.5"
I would like to note that this technique was first devised by Gwen Marston and shown in her wonderful book Liberated Quiltmaking. And once again, hats off to Tia for starting this heartfelt project! 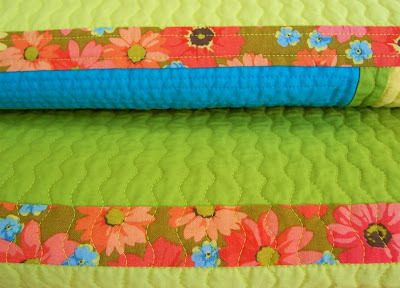 You can view more of my Tutorials HERE, and my Patterns HERE. 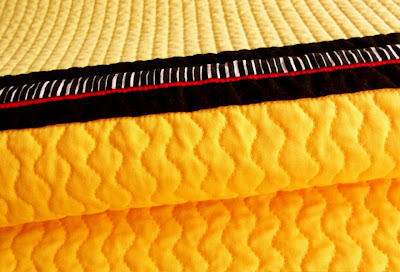 Tia of Camp Follower Bags and Quilts has started the BushFire Quilt Project. 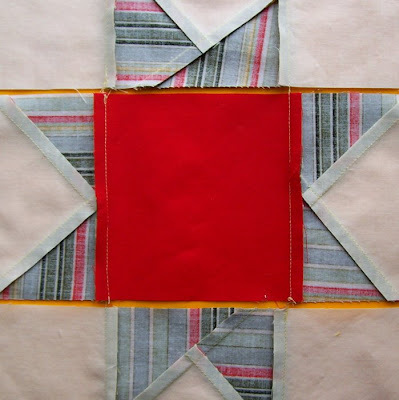 She is asking for donations of one or two 12.5" quilt blocks constructed in the "wonky" star pattern, first made famous by Gwen Marston in her "Liberated Quiltmaking" book. 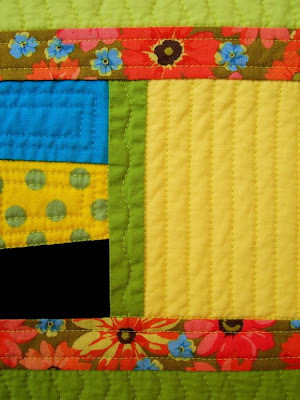 Tia will be assembling the blocks, (God bless her) into quilts to be donated to victims and survivors of the Australian Bushfires in a sincere desire to give tangible comfort. I think it's a fabulous idea and will definitely be participating. 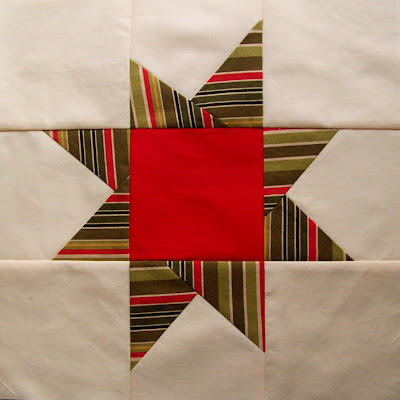 The stars can be any color and the background fabric should be a white, light or cream color. 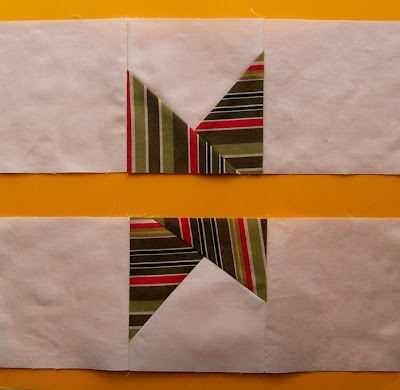 Don't be intimidated by making these star blocks! 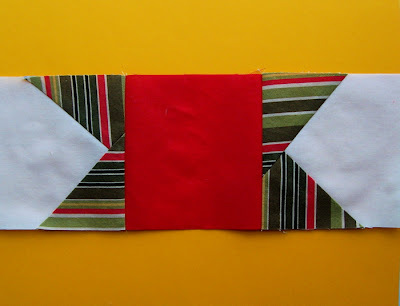 They may look fancy but are really very fun and easy to make. 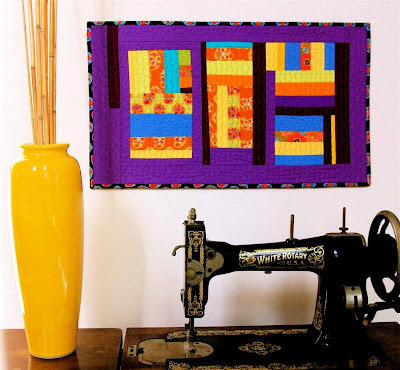 When put all together they create striking quilts. I think Tia picked a perfect block to help lift weary spirits. 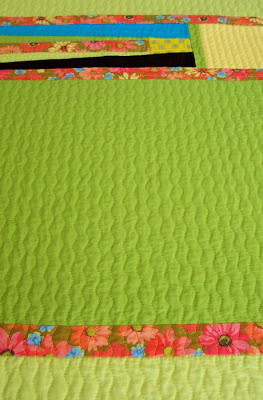 When I first started quilting it was one of my favorite blocks to make. 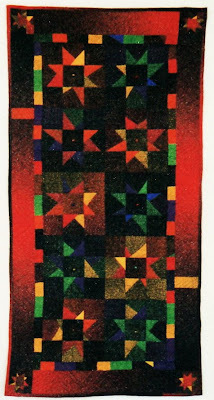 Below is an old blurry photo of an art quilt I made about 12 years ago using the stars. Hope you sewers will consider participating in this project, and many thanks to Tia. Her generosity of spirit is amazing and once again I am blown away by the goodness of people. 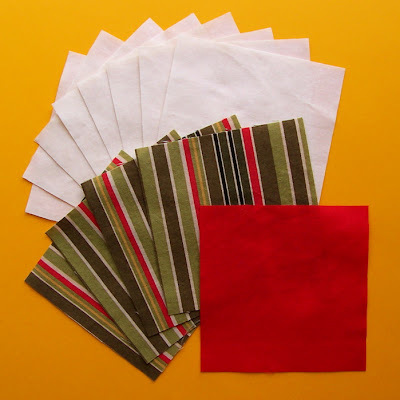 Also thanks to Jacquie of Tallgrass Prairie Studio for spreading the word about this project. I wouldn't have known about it had I not read about it on her blog. 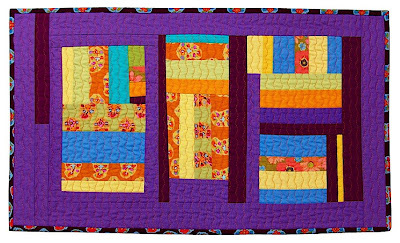 If this quilt had been a baby, it would have been born breech, because it was a difficult quilt to birth. Don't ask me why, as I have no idea. 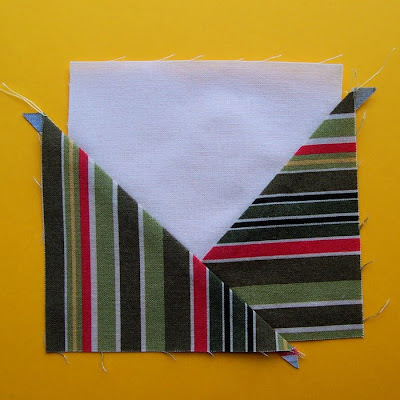 The piecing was a simple piece of cake, and the quilting should have been as well, but for every two stitches I took, another one had to be ripped out. If it could go wrong it did. 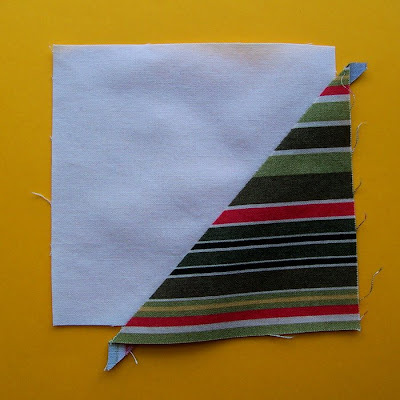 Broken threads, mysteriously faulty tensions, me getting off track from spacing out, (or more like glazing over in pure fatigue). It was a true exercise in going with the flow, and keeping my sense of humor, (which at times I didn't do so well with. Good thing it's winter and the windows are closed, otherwise the neighborhood kiddies riding their tricycles outside may have been somewhat traumatized by hearing the slew of profanity flying from my mouth.) Maybe it was just the universe's way of reminding me that as much as I might wish it to be spring, it's the dead of winter and I better just except that! 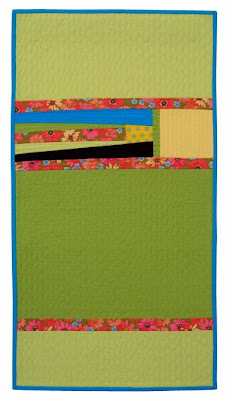 But seeing as this quilt is suppose to be a celebration of spring, I tried to quilt it as such. 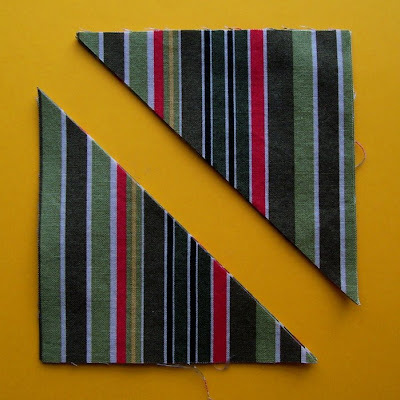 Stitching horizontal points above to represent blades of grass, and straight rows below to represent the farmer plowing the field behind our house. 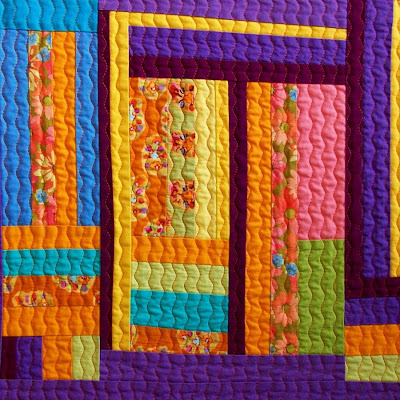 The majority of the quilt is stitched all over in my new favorite wavy stitch to represent the fluttery path of butterflies, and new growth emerging from the awakening garden beds. 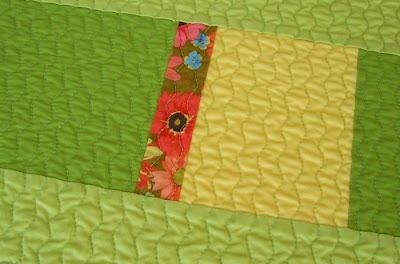 Remember the piece of yellow from my previous post, that I had hacked off the front when piecing the top? Well, waste not, want not. 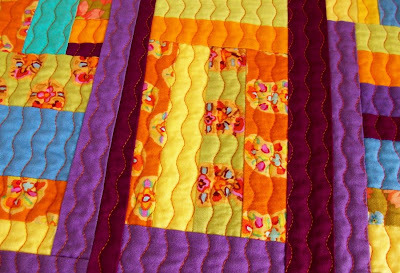 It survived and was added to the back of the quilt! 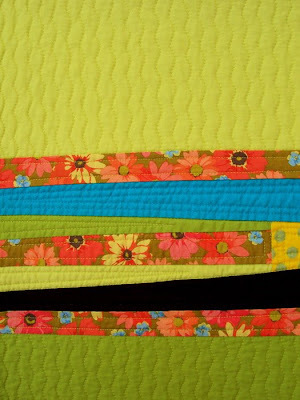 Spring Quilt is currently available in my Silly BooDilly shop.